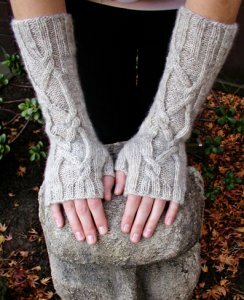 : The gorgeous cabled mitts will work up perfectly in Imperial Yarns' rustic yet soft sportweight yarn. Size US 4 needles for working in the round: DPNS, one long circular, or two short circulars (or size needed to obtain gauge) and one cable needle are required but not included. Hand Circumference: 6.5". Length: 12". Finished Gauge: 24 sts = 4". Color shown is Natural Grey in Tawanda Farms Romney Wool. We substituted Tracie Too which still has the handspun effect.